From award-winning picture book makers Alexis Deacon and Viviane Schwarz comes an enlightening new story about courage and making a difference. From award-winning picture book makers Alexis Deacon and Viviane Schwarz comes an enlightening new story about courage and making a difference. For budding philosophers of all ages, this is the uplifting story of Henry Finch the loveable little bird who strives for greatness, gets it all a bit wrong, then makes it right again in a very surprising way - truly becoming great. Henry Finch is a total inspiration. This is an inspirational book. It is also very funny. 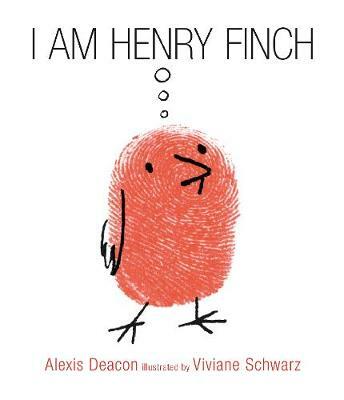 I Am Henry Finch is a book for everyone - from the very young to the very old. It is for dreamers, philosophers, artists, the foolish and the enlightened. And anyone with a big bright idea. Vegetarians will love it too. A profound picture book experience told with simplicity and style. Alexis Deacon is one of the most subtle and innovative writers and illustrators working today and a Waterstones favourite. Amongst his award-winning books are the children’s picture books Beegu, I am Henry Finch and the mythical, supernatural graphic novel Geis.